Praise the Lard! Pre-order our new book now! We’ve been absent from this space for months while we’ve been hard at work on our upcoming book. 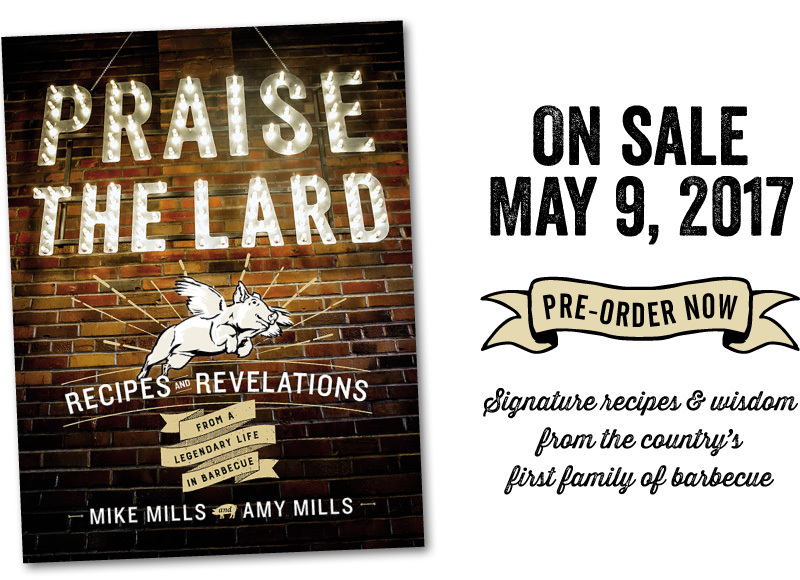 We’re delighted to announce that you can now pre-order Praise the Lard from any of the links listed above. While our first book Peace, Love, and Barbecue is about 17th Street — along with 50 or so of our closest friends — Praise the Lard is a deeper dive into our world. This book is a love letter to Murphysboro and to our family. It traces my daddy’s and my parallel journeys in barbecue. Mike Mills and Amy Mills, the dynamic father-daughter duo behind the famous 17th Street Barbecue, are two of the most influential people in barbecue. Known as The Legend, Mike is a Barbecue Hall-of-Famer, a four-time barbecue World Champion, a three-time Grand World Champion at Memphis in May (the Super Bowl of Swine), and a founder of the Big Apple Block Party. A third-generation barbecuer, Amy is the marketing mind behind the business, a television personality, and industry expert. Praise the Lard, named after the Mills’ popular Southern Illinois cook-off, now in its thirtieth year, dispenses all the secrets of the family’s lifetime of worshipping at the temple of barbecue. At the heart of the book are almost 100 recipes from the family archives: Private Reserve Mustard Sauce, Ain’t No Thang but a Chicken Wing, Pork Belly Bites, and Prime Rib on the Pit, Tangy Pit Beans, and Blackberry Pie. With hundreds of food and candid photos, this book is as rich as the Mills’ history. We’ll be making a big splash this spring and summer with a book tour, events, giveaways, and more. Stay tuned for more details! Thank you! I’m not sure if we’ll make it to Evansville, but my cousin, Chris Mills, has a barbecue food truck there called “The Flying Pigs!” Look for him! As I told you in a previuos email, I want to order the book directly from you so I can have it signed by you. Please email me when you have it available. We’ll send out a newsletter when it’s up on our site. It will be mid-May. Thank you! Will you be selling your new book at the restaurant? I plan on stopping in on May 4 and 8th on my way to Memphis and back. We allways start and end our annual BBQ trip in May from here in Chicago at 17th street. Best ribs in the country. Look forward to your new book even if I have to order it. Hello~ We’ll have the book in the restaurant beginning May 9 — the release date. If you will ask at the counter for me, I will be able to sell one a day early! We look forward to welcoming you! This book is fantastic. Love the stories about the Grand Lodge and Family. Cant wait to get my cook on. So kind of you to write! Very happy you’re enjoying the book! Where can I get the book in the Washington DC metro area? It’s available at all Barnes & Noble stores and Kramers in DuPont Circle! Thank you! I have no interest in purchasing a book, which condones and perpetuates cruel and inhumane murder. You’re on the wrong site, buddy. We wish you well. You can see sample pages on amazon.com.